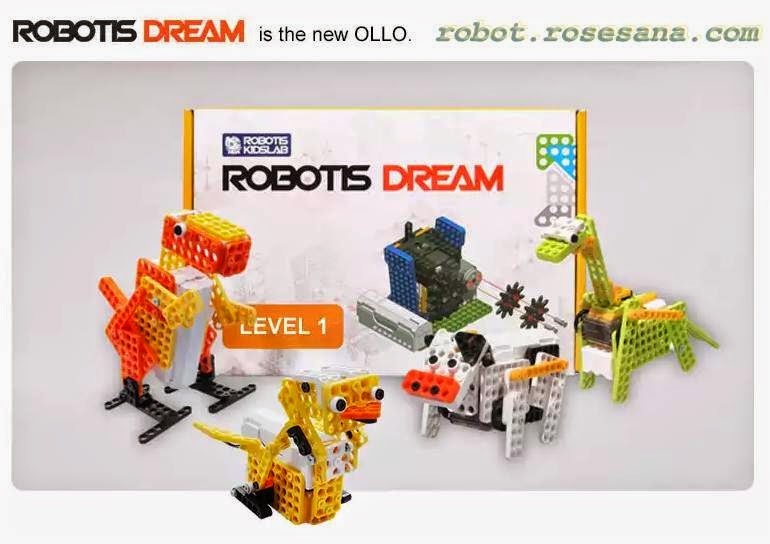 Characteristics ROBOTIS DREAM Level 1 offers learning system from the very basic of robotics using parts to learn about power and electricity, center of gravity. ROBOTIS DREAM Level 2 teaches you the basics of how a robot moves, which includes the usage of sensors, speed and force, gait, and drive. This level comes with 12 chapters to help you understand the scientific and physical theory using experiments as you build the robots chapter by chapter. ROBOTIS DREAM Level 3 comes with the controller and teaches you the principles of servo motor control, usage of the touch sensor and IR sensors, and LED modules. This level will help you understand the flow chart to set up your ground work for programming. ROBOTIS DREAM Level 4 comes with a remote controller to control the robot in many ways. Now that you have an idea of how the flow chart works and have a basic knowledge of programming, this level allows you to prepare for competitions. ROBOTIS DREAM helps you understand not only the principle of movement. but also speed and force. principle of a leverage. elasticity and inertia. Block toys and figures can be boring. Use ROBOTS DREAM to create the robot of your dream! Have you lost interest in wheeled robots? ROBOTIS DREAM enables you to create bipedal. quadrupeds. hexapods. as well as other different robots. " Expands into more interesting robots using various sensor. Challenge yourself to program your own robots using our RoboPius software. This software is also being in the Bioloid, Dynamixel, and higher level robotics. ROBOTIS DREAM will change your mind about the stereotypic idea that many people have. Who says robots are dull and boring" ROBOTIS DREAM can be expressed in cool and awesome ways! ROBOT IS DREAM uses a li-ion battery for easy and convenient use and operation of robots. ROBOTIS DREAM does not require any soldering or dangerous tools to assembly the robot. Not only that, the electric circuits are not open.